Vinegar Hill is known for being a quaint place that hides in the shadows of Dumbo. Many walk through it but do not know that it is a separate neighborhood from Dumbo. The buildings are Greek row houses that go from the Brooklyn Bridge to The Brooklyn Navy Yard. It is currently occupied by residents who want to stay close to the busy neighborhood of Dumbo but want to enjoy the piece and quit the city has to offer. During the 1800-1900s Vinegar Hill was known as “Irish town” although many other groups lived in the area. Many of the buildings were demolished when ways of transportation started to be built. Many of the buildings today are from the mid 1800s. John Jackson and Joshua Sands were developers who purchased land in the area and sold some of it to the U.S government for Navy Yard. They later built more housing for those working at the Navy Yard. houses were raised, and parking lots/warehouses were more frequent. During the 1920s put a large power plant that separated the waterfront from the neighborhood. As time Vinegar hill became smaller and slowly got demolished due to the building of the Farragut housing and the Brooklyn Queens Expressway. After many people moved out of vinegar hill to go live in the suburbs, many people moved in because of the cheap rent. 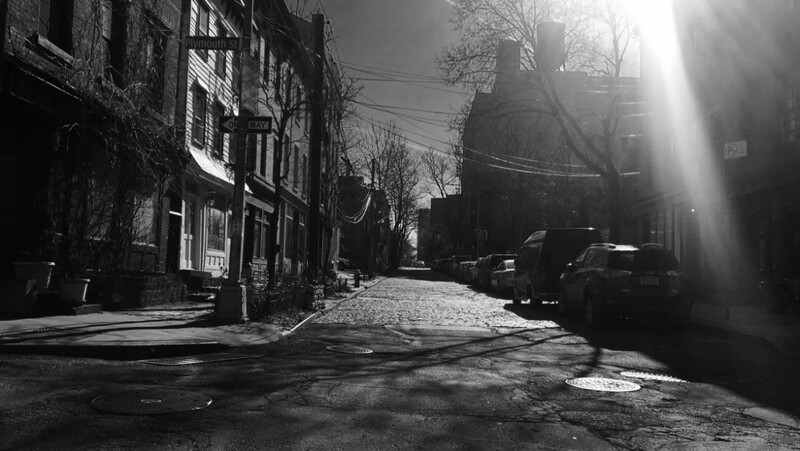 Artists that were moving to Dumbo also moved into Vinegar Hill. 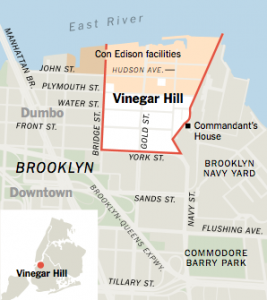 The recent decline in artists in Vinegar Hill is due to the raise in rent. More rich corporate people are living in these apartments due to the waterfront and the antique vibe.